Jack Herer is a Sativa-dominant cannabis strain named after marijuana activist and author of “The Emperor Wears No Clothes.” The creators of Jack Here strain Herer hopes to combine the cerebral high associated with Sativa strains and the heavy resin production of indica strains by crossing a Haze hybrid, Northern Lights #5 and Shiva Skunk. Jack Herer’s flowers are characterized by light to medium green leaves. It has densely-packed elongated buds. The trichome coverage is very high, making this a very sticky plant to handle. Jack Herer has a sweet, woody, and citrusy aroma. It has a flavor that resembles the taste, but with a hint of pines and trees. It is mild on the throat when inhaled, and leaves a sweet citrus that lingers for minutes. 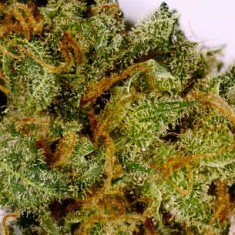 Jack Herer has a rich genetic background which accounts for several different variations of the strain. Each phenotype has its own distinct properties and effects. This strain hit users with a strong head, energetic head rush. The sensation spreads down the neck and through the limbs, releasing a feeling of relaxation, mental alertness, and a spur of creativity. This makes it ideal for getting things done during daytime. The strain is also known to facilitate brainstorming and conversations in social settings. Generally, this Sativa-dominant hybrid provides a blissful, clear-headed, and creative feeling. The mild high Jack Herer provides is good in the treatment of mental and neurological disorders such as PTSD, ADHD, anxiety, and depression. It has also been proven to be effective in the treatment of chronic pain, arthritis, headaches, nausea, and fatigue. Great, energetic high. Great for pain too!